Riviera Nayarit Mexico Blog: The best of Mexico is now closer than ever! The best of Mexico is now closer than ever! Mexico’s stunning Pacific Coast is famed for embodying the authentic spirit, vibrancy and diversity of the country. This season, two of the most attractive destinations in the Mexican West Coast, Puerto Vallarta and Riviera Nayarit, will once again be within easier reach for UK travellers. 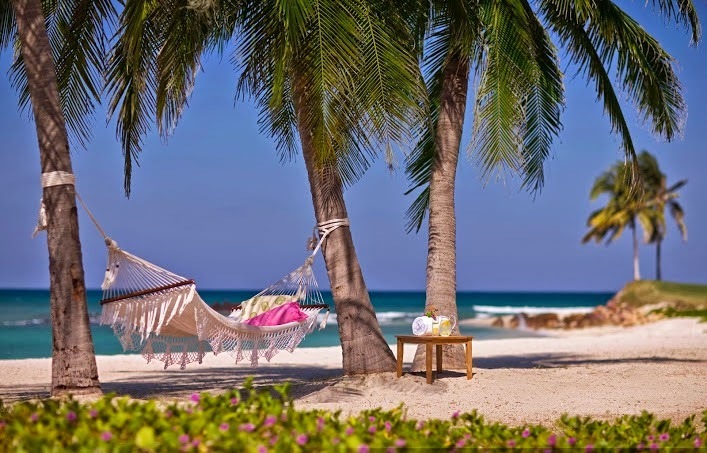 Launching on the 3rd May 2014, new direct weekly flights from London and Manchester to Puerto Vallarta International Airport will bring these treasures of Mexico within closer proximity to the UK market than ever before. The airport serves both destinations, which are united at Banderas Bay, (the 7th largest bay in the world!) and while Puerto Vallarta (located in the state of Jalisco, birthplace of tequila and the Mariachi - the Mexican cowboy) is nestled in the bay, Riviera Nayarit unfolds 10 minutes north of the airport, along 190 miles of picture-perfect coastline in the state of Nayarit. Visitors will arrive in the midst of two equally naturally-rich and exciting destinations, where the opportunity to embark on a mind-blowing, Mexican adventure will commence. From whizzing down the longest zip-lining circuit in Mexico to trekking through the rainforest via crashing waterfalls and tropical lagoons; and wondering through traditional villages home to descendants of the Aztecs - not to mention the scattering of captivating wildlife you’ll meet along the way. As well as the exhilarating activities, a backdrop of breathtakingly diverse landscape awaits. Encased by the Sierra Madre Mountains yet with pristine, sandy beaches and deep blue Pacific waters within easy reach; the views and constant subtropical climate will remain locked in the memory bank long after your exploration comes to an end. Puerto Vallarta has a long-standing reputation in Mexico, as it was put on the map following blockbuster film “The Night of the Iguana” back in the sixties (filmed entirely on location there). The picturesque destination soon attracted a plethora of Hollywood’s finest old-glamour celebrities (namely Elizabeth Taylor and Richard Burton’s romance flourished on the very shores) and to this day remains a traditional, renowned must-visit destination in Mexico. While Riviera Nayarit has fast-become the newest addition to the holiday scene, as news of the stunning coastline, unrivalled luxury including top-class spas, PGA golf courses and exclusive resorts, has caused quite a stir. Combined, both destinations have plenty to offer for any kind of traveller, from adventure-seekers and wildlife enthusiasts, to families and honeymooners. An abundance of wildlife is available to spot within the luscious, natural surroundings, a dream for animal-lovers who will rejoice at the sight of indigenous turtles and one of the largest, colourful bird populations in the world. One of Mexico’s largest bays, Banderas Bay (Bahía de Banderas), stretches across both regions and is home to exotic sealife and endangered species, making it a prime ecotourism destination and must-visit spot. From interacting with spinner dolphins to whale-watching (the bay is the birthplace of the Humpback Whale) as well as the signature Olive Ridley marine turtles who can be spotted by the dozen, there’s plenty of fascinating sights to be discovered. Upholding tradition is at the heart of both regions and visitors can learn a lot from the locals by visiting the quaint and picturesque towns. Encompassing a range of separate ethnic groups and celebrating the arts and gastronomy with dedicated festivals, unearthing the culture within Mexico is both an interactive and joyful experience. Take a trip to the remote mountain villages and discover the simple way of life of the Wixarika Indians who still live according to the ancient pre-Columbian traditions. Luxury comes in many forms, from meticulous attention-to-detail to a warm welcome and that’s aside from the lavish surroundings. However, between both regions luxury reaches a new meaning in this part of Mexico. Both destinations are also known as a golfer’s paradise with 9 championship golf courses including four designed by Jack Nicklaus, complemented by 5 and 4 AAA award resorts and properties. All of which can be enjoyed leisurely with views of the ocean and rugged mountains. For the avid spa-goer, world-class establishments await offering the very unique, signature treatments derived from Mexican tribes. Exclusivity is guaranteed when visiting the gated resorts in upmarket development, Punta Mita, not only Riviera Nayarit´s but Mexico´s most exclusive development. Beautiful natural landscapes and romance go hand in hand, so it’s no surprise that both regions rank highly for destination weddings, honeymoons, anniversaries or any reason to celebrate your love. In fact, Puerto Vallarta is 5th most romantic destinations in the world in which to get married. Not only do the surroundings evoke feelings of eternal affection, but also the various establishments including gourmet restaurants and stunning, boutique hotels are fully prepared to cater to every couple’s need, mastering attention-to-detail to perfection. Offering a mix of authentic, contemporary and international cuisine, every meal enjoyed within the confines of both regions will enrich your palette with every bite. From foodies seeking out family-run taco-stands and the fresh catch of the day, to gourmet creations, there’s nothing short of choice when it comes to mealtimes.